Well, it's engagement season once again and millions of couples are about to announce their engagements to their families this holiday season. Here are the top most popular days to announce your engagement. Why do so many couples get engaged between Thanksgiving and New Year’s? Of 10,000 engaged couples surveyed, it is found that 31% thought Christmas Eve was the best day of the year to propose. Another 7% opted for Christmas Day, 2% chose Dec. 26, and 18% said New Year’s Eve was the optimal date for proposals. Now, I know that many couples choose Thanksgiving as their day of choice. Usually Thanksgiving is a time when all the families come together to celebrate, and what better time for you to announce to your parents, siblings, and in-laws that you have decided to finally set a date and get married? Proposals today are largely a symbolic gesture, and so they feed off the symbolism of the holiday season. You’re symbolically creating this new family, and what better time to tell everyone than during the holidays. Thanksgiving is the first of such holiday, and is a great time because most folks have more time off to spend together. After you tell them, you have countless hours of talking with your mom and sisters about your wedding plans, bride's maid choices, dresses, venues, colors and all that goes with your wedding plans. More bridal magazines are sold between Thanksgiving and New Year's as soon to be brides look for that perfect wedding dress, study wedding etiquette, when to send out invites, cake flavors, seasonal color schemes and more. This is a great time to think about having a destination wedding. A destination wedding not only brings together your families in an exotic location, but if often a way to keep the guest count down to the most important of family and friends. A destination wedding is also often less expensive than even a wedding at home. You are going to spend money on a honeymoon anyway, why not combine the wedding with your honeymoon plans? And the memories that you take home with you having all your family and friends to share it with. This is where we come in. Hawaiian Island Weddings takes nuptial arrangements to new heights. They have 30 different wedding packages to choose from on four different islands in Hawaii. Weather you want to said "I Do" on a secluded beach at sunset, or amidst a gorgeous Hawaiian chapel, they have just the venue you have imagined. Being married on the beach is by far the most popular way for most couples coming to Hawaii to be married. 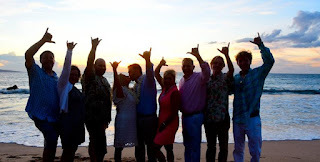 Not only are beach weddings more affordable (since you don't have to pay for a private site and all that is required is a Beach Wedding Permit, that we will provide), there is, almost always, great weather in Hawaii and the sunsets can be spectacular! 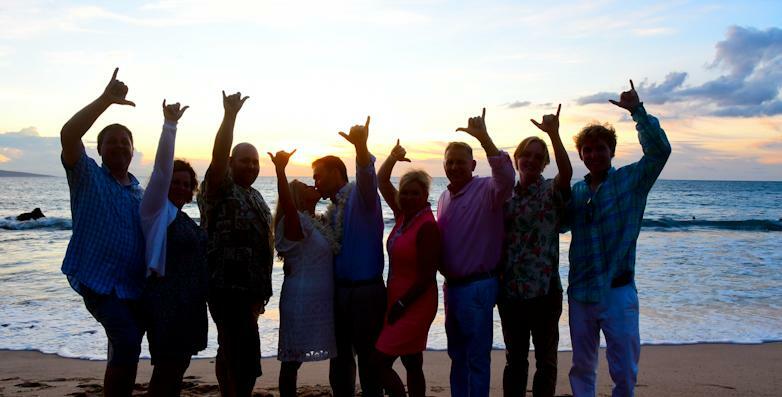 We offer simple beach weddings on Maui, Oahu, Kauai, and the Big Island or Hawaii. See all of our simple beach wedding packages. Many couples come to Hawaii to be married in the more traditional way, with a formal catered reception following, with music, DJ, dance floor, the works. You'd be surprised how much cheaper this can be here in Hawaii than on the mainland. The first thing you will have to consider, aside from time and date of course, is where to have your wedding celebration. Fortunately, there are a number of Oahu and Maui Wedding Venues to choose from. Some locations will handle smaller groups, like 30, and others are able to host groups of 200 or more. Since we have the local knowledge and expertise, and we have handled all the intricate details for many couples for the past 25 years, you can rest assured that your wedding venues at a private estate, restaurant, golf course, or tropical garden will be handled completely and competently. As we say, "picture perfect". One of the major concerns for your wedding will be where to stay of course, fortunately, Hawaii has many fabulous resorts and hotels for your wedding and honeymoon here in paradise. These top resorts offer all of the amenities you expect with 5 star service and gorgeous ocean views. From beauty and spa services, to Mai Tais by the pool, you'll will be impressed with the Hawaiian hospitality and aloha spirit shone upon you at these top resorts - no kidding! We have nine wedding and honeymoon packages to choose from, ranging from condominiums, to hotels, to private luxury villas, located on Maui, Oahu, Kauai and Hawaii. When you combine your wedding with your honeymoon and rental car, you will see that it's a more affordable option and it's like getting your wedding free. Each of these properties have been specially chosen by us (and we had to stay at every one to ensure the quality), to provide exceptional service, quality, and, of course, beautiful views. Just send us the details and we will send you a complete no-obligation quote.